Dell announced today that it will be introducing a 10-inch Windows 7 tablet specifically designed for the corporate world later this year. The company also plans to launch 10-inch Android OS tablets in the near future. The Windows tablet is called the XT3 and is part tablet, part PC. It features a keyboard and swivel screen that can fold to convert into a tablet. Tablets have largely been unable to infiltrate business environments, and Dell is attempting to do just this with the XT3. “A lot of our customers are asking us for a tablet-type device that better integrates with their enterprise systems and security systems,” Steve Lalla, general manager of Dell’s business client group told Reuters this morning. Dell’s theory seems to be that by introducing a tablet running business-friendly Windows 7 OS, it will finally break the unspoken rule that tablets are consumption devices only. But Windows 7 tablets have struggled and many analysts reason the OS as is simply isn’t suited for the platform. 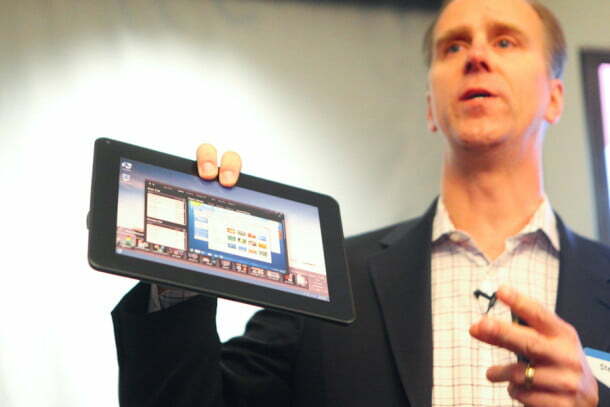 It will face stiff competition from RIM’s PlayBook tablet that’s set to debut this spring. Full specs haven’t been release yet, but Dell did confirm the tablet will run the Intel Core second-gen CPU. The XT3 is part of Dell’s new Latitude E6000 rugged laptop series. This isn’t Dell’s first go at tablets, it previously released the Streak 5 and Streak 7, which are respectively 5- and 7-inch Android-based tablets. But the manufacturer apparently feels ready to bridge the gap between work and play with the upcoming Windows 7 based tablets, which is expected to hit the market mid year.